If you weren’t into the Rivian R1T—an all-electric pickup truck from an American startup with up to 400 miles of range and quirky features like a frunk and cubby holes—then you’re just no fun. 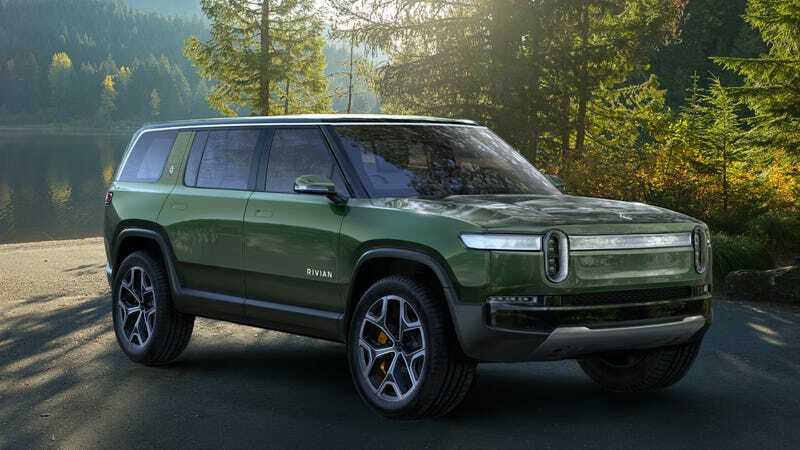 Time will tell if Michigan-based Rivian’s the real deal or more vaporware, but as of today it has more than just the truck on offer. Meet the R1T’s more practical cousin, the seven-seat R1S SUV. I’m into it. Like the R1T, the SUV is based on a skateboard platform, and despite its heft it is also claimed to do zero to 60 mph in just three seconds. Four electric motors, as much as 700 claimed horsepower on the top battery, and a claimed range of over 400 miles. Not bad, even with a claimed weight of 5,840 pounds. It’s all pretty impressive, at least on paper. And these pics show off a striking design for an SUV—boxy, outdoorsy-looking, sleek and aggressive, with huge digital displays inside. And yes, this one has a frunk too. There’s also a small liftgate out back that doubles as a seat. As with the R1T, three battery sizes are planned, and the 180 kWh and 135 kWh ones will be available at launch. A cheaper 105 kWh one will be available within six months of launch, the company claims. Also like the truck: a claimed 200 miles of range in 30 minutes of fast charging. Rivian says the R1S’ deliveries will begin at the start of 2021. As we mentioned in our story on the R1T, the company has acquired the old Mitsubishi plant in Illinois and has plans to invest over $175 million there by 2024. All of these electric startups should be taken with a grain of salt—Faraday Future taught us all that, if it did nothing else—but this U.S. company seems to be on to some interesting things. EVs are the future of cars, so I’m eager to see more new players get into that game. We’ll see what they’re made of soon, I guess. In the meantime, we’ll see this concept at the LA Auto Show this week.